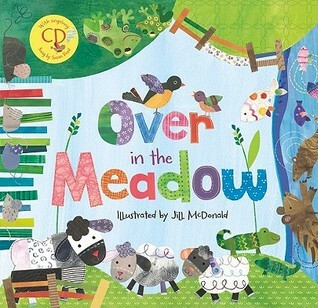 Over In the Meadow is a children's book full of rhyming and counting. I like this book because of the rhyming and response possibilities for the students. It also teaches children where these animals live and play. The illustrations were also bold and eye-catching, something lower elementary will enjoy. This vividly rendered picture book retells an old English folksong. Little readers will be enthralled by counting the baby creatures found in a meadow landscape. Panoramic collages and painted papers spread in a panoramic view over both pages, depicting each set of animals. Children will meet Mothers Toad, Sheep, Robin, Muskrat, Bee, Crow, Mouse, Lizard, Fish, Spider, and all their little ones. Maintaining the sing-song rhythm, each rhyming verse begins with bolded, black, larger text and then the text shrinks until the animals make their particular sound boldly. The first line and last line repeat the habitat of each animal, creating predictability for the reader. Painted papers and collage illustrations depict the animals and their meadow in a variety of dizzying patterns, except where the text is, to ensure readability. Little readers will want to linger over the striking pictures of primary patterned colors and their varying hues. These illustrations reflect the folksy history of the text with clean shapes and lack of perspective, as the animals appear on the same scale as objects located near them. This edition provides a CD with four songs. The first and last ones are introduction and closing credits. However, the second song features musician and storyteller Susan Reed and her daughters singing along with the book. The third song is an instrumental version of the song, for readers who may want to sing along without leaders and also reflects the folk history by employing fiddles and banjos. The author also provides a section about "meadows and wildlife" as well as the written music for the song. This book is sure to delight little and big readers and would be an excellent resource at storytimes. Highly recommended for public libraries. I had to read this in preparation for reading to kids (they were getting a copy of it). It's not a song I'm familiar with, so thank goodness for YouTube and the CD that's included. As I was singing it to the kids, they were astonishingly quiet - something that rarely happens. I know it wasn't because of my singing skills, so I think the illustrations must have captured their attention. One little boy got stuck on the fact that each page had an extra animal on it (because of the mother), so I don't think he liked this for a counting book as much as the others did. Still, fairly enjoyable and I hope the kids like their copies! I am deducting a star for what I feel is a gratuitous video animation CD included with the book. The song? Fine, so kids and parents can sing along. But for the same reasons that I wouldn't use this in a storytime, this is the sort of illustrations that should be pored over and examined by a child in a parent's lap, or a child on their own, not watched on a computer. The patterns and designs are lovely and complex and too good to be watched speedily on a video! I didn't hear all of this book, but what I heard I liked it. It was a nice mix of counting an animals. The illustrations were pleasant. The text seems to be quite popular as there are many different versions. a little long but the interactive singing/repeating feature might make it worth it. Each animal is introduced with over in the meadow and then talks about the animals habitat and the sounds they make which is repeated by all who live there. This is one of the more appealing versions of the classic rhyme/song...nicely illustrated title to share with preschoolers through early elementary students. Includes CD with both audio/video. pretty picture, and my kids enjoyed me reading this book to them. Song and Rhyme...love the scrapbook illustrations. Smart book: Dictionary about all the different animals featured in the book. Beautifully illustrated collage pictures-- bright, engaging, would be fun to extend with collage art. I seriously dislike the text. Even doesn't rhyme with seven!